Let’s see if Mary has decided what to give her secret admirer. I’ve figured out what I want to give him! The baker in Silverglade Village makes the best chocolate hearts I know! I’d like to give him a whole box, but I don’t want him to know they’re from me. Could you ride to the baker, order and box and give it to the cute guy? He usually sits on a barrel by the fountain. I’d be soooo grateful! Objectives: Talk to the baker in Silverglade Village. Ride back into the village and speak with Harold about ordering a box of chocolate hearts. You again? Do you want more candy? You sure know how to woo people. Now let’s go see if the cement has been successfully unloaded at the Winery. Heya! Like I said, you can always trust Lightning! All the cement is in the cellar. Objectives: Speak with the trainee in the basement again. Go to the cellar and speak with the trainee. Hi there. Now we have a lot of cement. Hmmm… I’m not sure what to do but I will do my best. There is another thing that maybe you can help me with? You understand I don’t have a GPS to help me navigate this thing. The G.E.D. guys didn’t think I would need one. “No room in the budget” the boss said… But without one I don’t really feel save starting to drill again. But I have an idea. I know that at the oilfield near here there is a shed where they store both maps and GPS consoles. Can you ride over there and see if we might be able to get one? Objectives: Ride to the oil field and get a map and a GPS from the shed there. The guard is standing just inside the oil field area, near where Mr Kembell is. Are you my relief? Wait a minute… I don’t see very well. Let’s get a look at you. Hmm… hm… no! You are not employed by G.E.D. Listen here! Take a few steps back please, this storage is for employees only. No no no! Take a few steps back. You won’t be getting past me. This storage is very very important. How long will I be standing here? I’m waiting for my relief now, he is a bit late but I won’t be leaving my post for that. I’ll wait for him if it takes a week. And don’t try anything funny. I have eyes like a hawk! Maybe a near-sighted hawk, but a hawk nonetheless! Objectives: Ride over and speak with the trainee again. Ride back to the cellar and ask the trainee if he has any ideas what to do. Oh… I don’t know… Short sighted you say? If you go look for something to build the doll with I will take off my clothes. And you’ll need to promise me you won’t peek! Promise! Objectives: Look for things in the cellar you can build a doll with and speak with the trainee again. Go into the room down the hall, as well as the boiler room across the hall, to find the items to build the doll. When you have found all three of them, return to the trainee. Here I am. 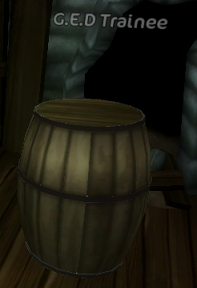 Here in the barrel! Let’s see. Hmmm… Do you really think this will work? You would have to be almost blind to be fooled by this. But this might be our only chance. Objectives: Ride over to the oil field and try to fool the guard with the doll. Place it on the field so he thinks it is a person. Hrmmm… Are you here to relieve me? You are dressed like a G.E.D. employee and are tall and proud, so you must be my replacement. I like you! You can relax a little now… You don’t need to stand at attention the whole time… Though I like that you are showing me so much respect. You don’t say much do you? Great! There is always too much talk around here. Focus on the job, that’s my advice. A word of warning though. Watch out for this girl who is trying to get into the storge shed. She is pretty tricky, but she won’t fool me! Objectives: Take the map and GPS from the storage shed. Ride back to the winery when you have them and speak with the trainee. Both items are inside the shed, when you have picked them up, take them to the cellar by the trainee. Brr… It is really cold in here… Hey! You are back! Can I get my clothes back now please? Brrr… So cold. Lie them down beside my barrel and leave the room so I can change please. And no peeking! Objectives: Go out of the room so the trainee can change his clothes in private. Go back and speak with him again after. Once he’s changed, go back and speak with him again. There we go! Nice to have some clothes on again. Now you can look. Now I’m going to use this cement so that all traces of my mistake are gone. If you have upgraded to become a star rider, these quests will instantly become available. Enjoy! Rita, we seem to be having a problem with Rosie, the cow standing over there by the wall. She’s been acting strange lately, hanging her head like she’s all sad or something. The vet was here but couldn’t find anything wrong with her health. I’m sure that something is not right, though, and I can’t bear to see her like this anymore. It occurred to me that Mrs Holdsworth has a great hand with cattle. She used to have a farm herself when she was younger and she often tells stories about different cows she remembers, like they were all friends of hers with unique personalities. Maybe she knows what we could do to cheer Rosie up. Will you go talk to her? Objectives: Go to Mrs Holdsworth and ask for advice on Rosie the cow. The cow is sad, you say. And you want me to cheer her up? I had the same problem with one of my own cows a long time ago. Her name was Wendy and she would get the most lifeless eyes sometimes… She would stand in a corner staring in front of her, like all hope was gone. But I cured her. Can you guess what I did? I remembered that she had escaped from the enclosure once and gone to my garden where I found her eating dandelions. So I went and got a bunch of them, and made them into a brew that I fed to Wendy. Did wonders! Why don’t we try if that works on your cow, as well? Get me five dandelions and I’ll make the brew for you. Objectives: Pick five dandelions by the eastern stable wall and give them to Mrs Holdsworth. These look fine. I’ll have the brew ready for you in a while. Here is your brew, dear. Give it to her right away. And remember to talk to her while you’re at it, everyone appreciates a little attention once in a while. Good luck, dear! Objectives: Give the potion to Rosie the cow and tell May what happened. Let’s go make sad cow not so sad! She actually does look happier. What did the trick? A dandelion potion? Would you believe that! What in the world?! A cloaked rider just came by and took my original documents! Ride after him, will you? He’s just over there by the gate! Hurry!! HURRY! Catch him! Objectives: Ride up close to the cloaked rider and take back Thomas’ documents. Chase after the rider. He isn’t too hard to catch. Well done. I will try to hide the papers better this time. Sorry? There was something strange with the horse? Like what? Ghost-like, you say? Um… I really can’t say – it all happened so fast. I’m sure it was just a regular horse with an unusually nasty owner. And this isn’t the last time we’ll be seeing this mysterious figure… oooohhhh…..
Hi there, how’s it going? Welcome to Fort Pinta! I’m James and I run this place. Actually, right now I’ve got LOADS to do. See all those people? They all want to, like, enhance their trip here with a gallop along the beach. On my horses. And their children, they’re… they’re everywhere! At least that’s what it seems like to me. Hey, this might sound weird, but I kind of like these people after all. They pay the bills for me, don’t they? In fact, I could use even more of them! Would you help me with something? Take these advertising posters and put them up on spots you think seem good. Everyone should know about my riding center! Objectives: Put the posters up around Fort Pinta. Put the posters up and return to James. Wow! I can’t believe how great that looks! This place will be crawling with tourists! You know what, I kind of have this… like, thing I want to do. Besides taking care of the stables. You might think it’s silly, but I totally love postcards and would like to make my own. Besides, that would be another good way of getting some money out of these people invading my riding tracks. I want to take some nice photographs and turn them into postcards, but the thing is, I lost the memory card to my digital camera and every time I’m on my way to the store, it’s closed. I already ordered a card online and paid for it – it only needs to be picked up. Do you think that you could do that for me? Objectives: Pick James’ memory card up at the shop and deliver it to him. This is the point where we learn that James is an incredibly scatterbrained and lazy person… But that just means more money for you! The store with the memory card is only a few feet away. Collect the card and return to James. Finally! You have my memory card. Thanks! Hey, who am I kidding? I don’t have time to take the photographs either. Maybe you could do that for me, too? And then I’ll turn them into postcards! Here is the camera. Ride around for a while in the area and shoot some nice views and stuff. That would be a great help! Objectives: Take five pictures that James can use for making postcards. 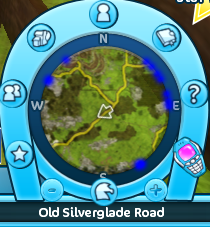 Ride to the highlighted areas, and use the camera from your inventory. It’s funny when your horse photobombs the picture. These are awesome! You know what, why don’t you keep taking photos for me whenever you return here? The tourists will go crazy for these! You know what, you really deserve to try out my riding track. I really think you should, actually – it’s totally great. Objectives: Race the Fort Pinta track. This one is a little tougher than the Wild Bobcat track, and there are obstacles, that avoiding will take more time, but once you learn how to jump the track becomes quite easy. Sweet, seems you’re a good racer AND a great photographer. One more character to meet today, Mary, up at the Abbey. I know! You should pick some fresh grass and give to her, that’s her favorite food! That should calm her down and make her follow you or at least going at my direction. Feed her more tasty grass and she will follow you! Objectives: Find Mary’s lamb that has leapt over the fence. Pick fresh grass and give to her to make her follow you. You don’t need to pick ALL of the grass, I got the lamb home with eight pieces. She’s pretty easy to find, she’s in the field west of Jarl’s Road going north. You found her! You are truly the bravest of the brave! To go forth into the unknown fields of Moorland, face unspeakable horrors and return unscathed with the helpless and innocent, asking for nothing in return. You are truly a Moorland Champion; I shall put in a petition for the town hall to build a statue in your likeness! In solid gold! Thank you dear rider, thank you! Aww, shucks, you’re too kind!